It started out as an overcast, rainy day in the mountains, but for now the sunshine has taken over. My windows are open, a soft breeze is twirling in, and the cicadas are busy buzzing. School started back today, my nephews began kindergarten, and my seasonal décor is out. Fall feels nearer than ever, and it is absolutely delightful. The cooler temperatures that have rolled in are so pleasant, but I admit I'm shocked August is this mild. I'll take it, though. If you've been reading the blog over the years, you know I'm smitten with autumn. It's the season I thrive in because it's full of all of my favorite things. One of those things I'm so looking forward to is cozy foods in the coming months. So I'm transitioning a little bit from fall to summer now when it comes to our dinner menu. And I'm starting with this Autumn Cobb salad and a homemade Spiced Cider Vinaigrette. Y'all, it is perfection one-thousand times over! 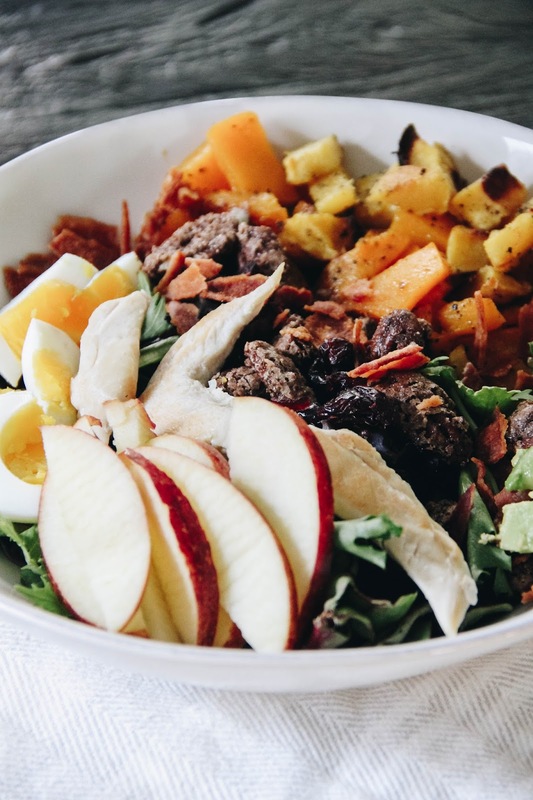 This time of year begs for a salad this scrumptious. p.s. if you watched my instagram stories last week, this is the recipe I was whipping up in my kitchen! 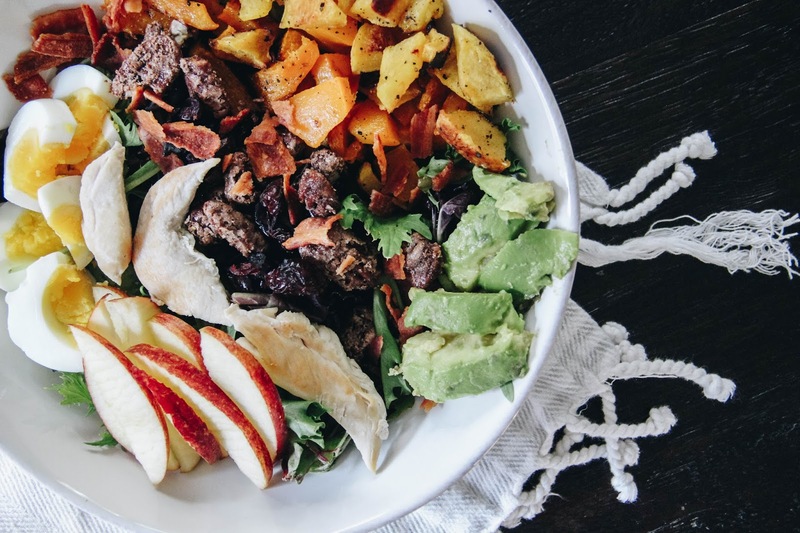 With the summer months being hot and humid, light meals are the best way to go. 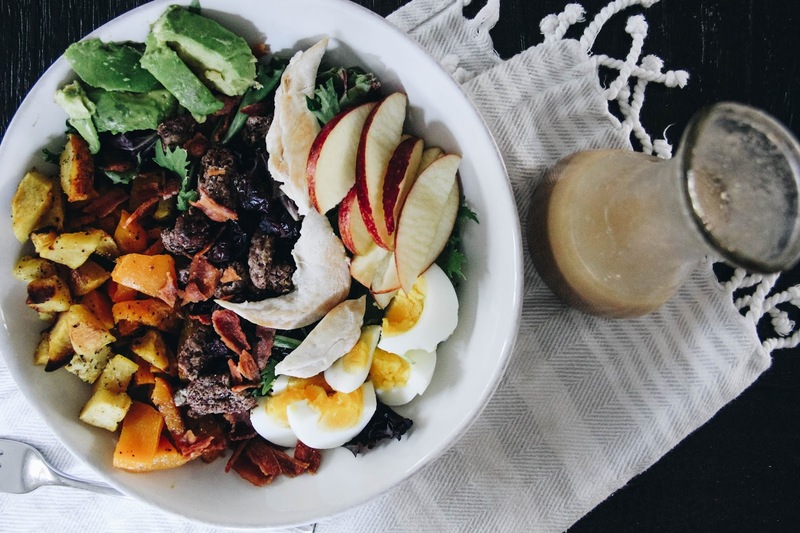 I took some inspiration from this recipe to make a Cobb salad that was full of all things fall, but also perfect for the last month of summer. Peel, de-seed, and cube the butternut squash and acorn squash. Line out on an aluminum foil-lined baking sheet. Lightly drizzle olive oil and toss with your hands. Then sprinkle the kosher salt over top. Bake at 400° for 40 minutes. To candy the pecans, whisk an egg white in a bowl, add the pecans, and the cinnamon/sugar mixture. Stir well. Spread over a parchment paper-lined baking sheet. Bake at 400° for 15 minutes or until the sugar looks crackled and hardened on top. To prepare the salad, lay out the spring salad greens on the bottom of the plate. Make rows of the ingredients: squashes, bacon, chicken, hard boiled eggs, avocado, dried cranberries, candied pecans, and apple. Drizzle with the vinaigrette and serve right away. 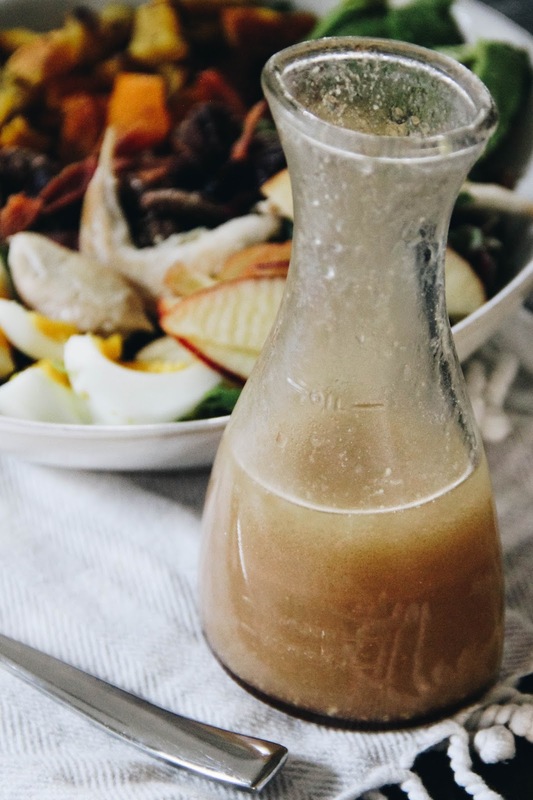 Whisk together the spiced apple cider, dijon mustard, and vegetable oil. Chill in the fridge unit you're ready to serve. Shake well when you are ready to use. 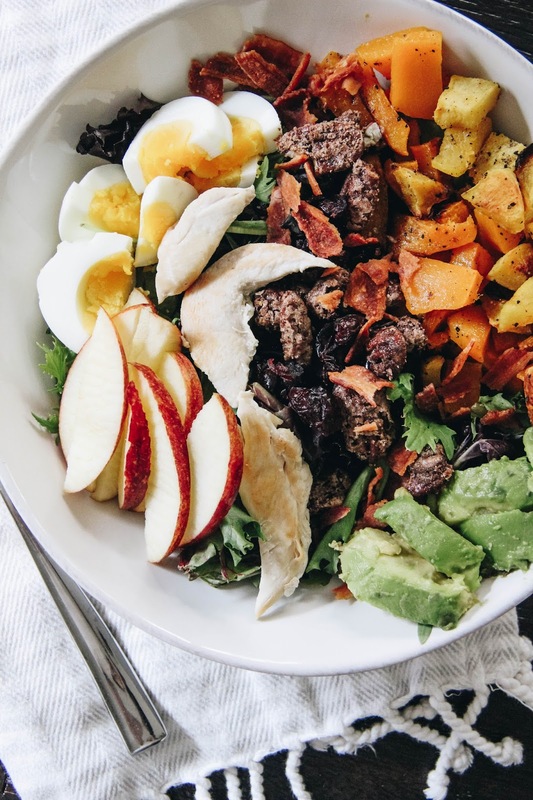 **Some notes for this salad. **It is certainly easy to make your own changes, substitute one ingredient for another, etc. I did various changes from my inspiration recipe to better fit my food preferences. **If you don't have spiced cider on hand, like myself, you can easily whip some up! If you're making your own. Use one cup of apple juice, a few shakes of cinnamon, a dash of ginger and nutmeg, and about 15 whole cloves. Bring the mixture to a boil and let simmer for about 10 minutes. Strain the whole cloves out, and your liquid will have reduced to 2/3 cup. 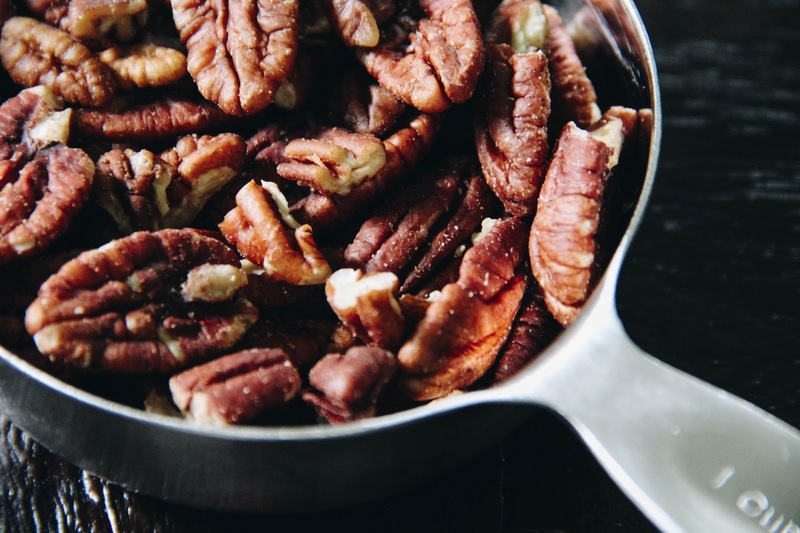 **You can make the candied pecans ahead of time and store them in a ziplock bag in the pantry for a couple of weeks.